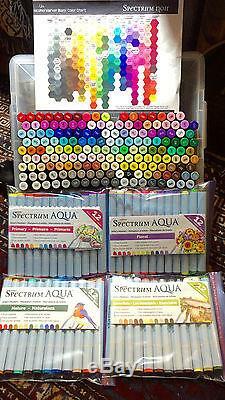 This is a complete collection of Spectrum Noir alcohol art markers and Aqua Noir watercolor art markers. All together there are 168 colors and 1 colorless blender alcohol markers and 48 watercolor markers. I bought them all brand new, and I only used a few of them a couple of times. Unfortunately I did not save the original boxes, but I have packaged them up by color groups for the alcohol markers and by sets of the watercolor. All have been swatched and those will be included. 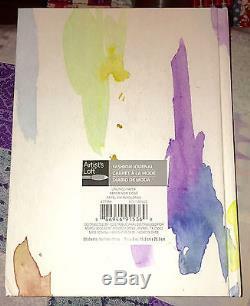 Also included is a brand new Artists Loft 6" x 8" mixed media blank art journal. So that is a total of 216 markers and 1 blender. This is a pretty great deal! Spectrum Noir is a range of 168 double-ended alcohol ink markers. With a broad chisel nib for large area fills and a fine bullet tip for detailed work, these markers are perfect for every papercrafting project. There is also an interchangeable brush tip nib, available separately, which can be used in place of the chisel nib to create some gorgeous effects. The numbers on the end of each Spectrum Noir marker indicate how intense or dark the color is. The numbering system was made for very easy understanding: 1 is very pale, 2 is a bit more intense/dark and 10 is much more intense/dark. The letters on the end of the marker specify the color tone family the marker belongs to. For example, CT = Citrus Yellow, TN = Tan, CR = Coral Red, CG = Citrus Green and so on. 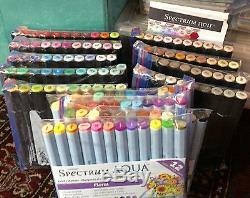 The Spectrum Noir range consists of 168 alcohol markers. The core set of seventy-two markers is divided up into twelve color families, each containing six markers per set. Each package contains pre-matched color tone families with three warm tones and three cool tones, allowing for several blending possibilities. There are no duplicate pens across the six-marker sets. There are also four sets of twenty-four markers, to round out the 168 pens Pastels, Lights, Brights and Darks. These sets have been designed to add to the core collection to increase the color spectrum. They will add darker and lighter colors to the color choices provided in the six-marker sets, as well as filling in some in-between colors. Again, no color is duplicated in any of these four twenty-four marker sets. Note: The twenty-four marker sets do not contain any blending partners, as they were made to complement or be added to the core set of seventy-two markers. You can achieve professional results every time with effortless blending and color matching Theyre available in tonal color sets for easy shading They have fast-drying ink for smooth and effective work The pens are non-toxic and safe to use The markers have an ergonomic hexagonal barrel design for greater comfort when coloring Each marker has a unique, no slip rubberized grip You can refill your markers once the ink has been used The marker caps are double-layered for extended time between refills Spectrum Aqua is the water-based artists marker that goes wherever your creativity takes you. From sketching and illustration to layout and design to Manga and comic art and paper-crafts too. Whatever your style, Spectrum Aqua combines the performance of water-based color medium with the easy to use convenience of a marker to give you outstanding color results. There are 48 colors available, split into four color-themed packs of twelve. Each Spectrum Aqua Marker is dual-tipped at one end, theres a soft brush nib for flexible line control and a more natural art surface feel. And at the other, a precise fine tip for definition and accurate line work. Spectrum Aqua is a great addition to conventional water-based paints and other color media. Its high quality dyes give flawless, even coverage with all the definition and vibrancy you need. Then, using water, you can diffuse and seamlessly blend color to create the lifelike tones and subtle touches that will bring added depth and realism to your work. They are dual-tipped, combining a soft, flexible brush with a fine point for adding detail and definition The markers have an ergonomic octagonal barrel design for greater comfort when coloring The rich, vibrant dye-based inks give super-smooth coverage The ink is water-soluble making it easily diffused and blended with water for an endless variety of subtle tones The markers are available in color groups for easy blending They are acid- and odor-free, are non-toxic and safe to use All of these great features make Spectrum Aqua perfect for sketching and illustration across a variety of subjects portraits, characters, wildlife, landscapes and more. 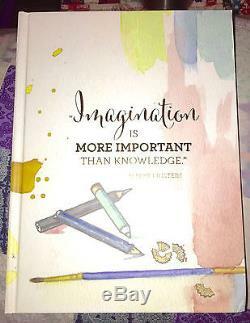 You can use Spectrum Aqua on crafting projects too for stamped designs with an alternative, more delicate water-colored look. Or for producing beautiful washes and background effects. Spectrum Aqua is also great for layout and design work, making it a handy tool for students. Enhance your portfolio with hand drawn renders, working alongside paints, pencils and other design media. Comes from a non smoking home. I ADORE my repeat buyers!! I usually do my feedback once a week, so if you have paid and your feedback isnt left right awayDONT PANIC! It will be left for you. The item "COMPLETE SET Spectrum Noir Art & Aqua Noir Watercolor Markers + Blank Journal" is in sale since Saturday, August 13, 2016. This item is in the category "Crafts\Art Supplies\Drawing\Pens & Markers". The seller is "strangemodegirl" and is located in Monterey, California. This item can be shipped to United States.